One of my favourite Sydney dive sites is The Balcony. 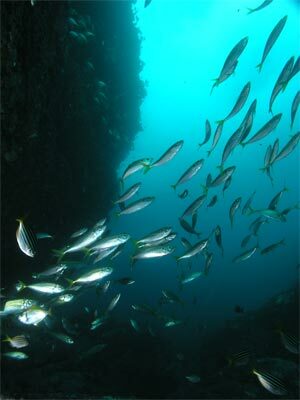 This site is, like so many other great dive sites, located off Royal National Park on the southern outskirts of the city. Further south than Jibbon Bombora, The Split, Barrens Hut and The Gullies (Underwater Wilderness), The Balcony is a dive that can generally only be best experienced in calm seas. This is because the dive boat must anchor very close to shore and the best parts of the dive are in water less than 10 metres deep. The GPS mark for the anchoring spot is 34° 06' 03"S 151° 09' 45"E (note that all my GPS Readings are using AUS66 - if you use any other datum, you will need to convert the reading - see my GPS Page for more details). The depth will be about 12 to 14 metres. After anchoring, head east to the sand and the edge of the reef. Here the depth drops to 20 to 22 metres. Turn to the left and follow the sand edge as it meanders along. There are sometimes sea dragons along this area. There are a couple of small overhangs and a couple of slits that contain species of interest. Afrer 10 or 15 minutes, you will come to a low rock on your right. Go up the gap between this rock and the main reef and you will come to a kelp covered snady/rocky area. Go over to the rocks and left and head west into the shallows. The terrain changes to boulders, small and large. 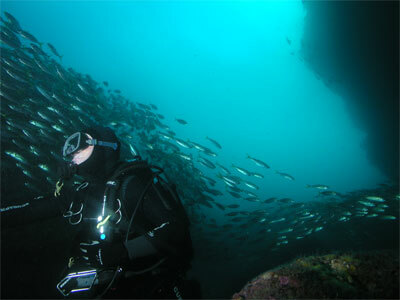 As you go, the depth comes up and you will eventually see huge amounts of fish. This site nearly always has huge amounts of fishlife, silver sweep, ladder-finned pomfret, yellowtail, silver sweep and more. It is arguable where the dive site got its name as two physical features at the site resemble a balcony. The first is the cliff face which has a large overhang and looks like a huge balcony. This is the more likely place it got its name as the other is a large wall below the water which also resembles a balcony. This is what you will come to if you have followed the directions above. The photograph below left is of the "underwater" balcony. It is always (and I do mean always) full of fish, normally huge schools of yellowtail as well as sometimes silver sweep and other fish. Follow the balcony into the shallows and you will end up in the depth of 5 to 8 metres. If it is calm enough, go shallower and head to the west and then south. If it is not calm enough, head south and south-west from here and follow the 8 metre depth level for 30 metres or so. You will come to another shear wall. This will be to the immediate west of where your boat is anchored. The wall here goes right up to the surface. You can also go a bit north from here as there are a couple of canyons between boulders. From here you can head further south for another 20 to 30 metres. Then you can go east right back to the sand and then follow this to the north. You should come across your anchor rope soon (or look up and see the boat). If you do not see, you should see some of the features your saw at the start of the dive. Refind he anchor. After this I usually spend some time in the 15 to 18 metre range examining the very large boulders. Some nice swim-throughs are formed by the arrangement of the rocks and you can easily fit through. There are normally lots more fish here. The site is nomrally alive with seapike, yellowtail, ladder-finned pomfret, bulleyes and many species of leatherjackets. 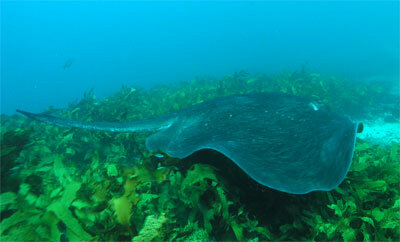 An enjoyable dive with 15 metres visibility.